Seabreeze Landscape Suppliers have the services and products you require to upgrade or update your building, hardscaping and landscaping projects. We know that any successful renovation or outdoor overhaul requires a great plan that includes superior materials, which we offer. We also provide a seven day delivery service across Perth and surrounding areas. We have a fleet of vehicle’s which can deliver any quantity of product you require. We also deliver Bulka Bags, Blocks, Pavers, Slabs, Soak wells, Sleepers, Letter Boxes, Pots & Bagged Products for your convenience. Buy in bulk and we will deliver to you any day of the week. As part of our commitment to service we also provide a complimentary trailer hire service with product purchases. Look no further than Seabreeze Landscape Supplies for all your landscaping supply services, which means you get great advice, a vast range of products and prompt delivery service. Our friendly staff are always are on hand to assist all tradesmen, residential and commercial development providers. With a lot of residential blocks be coming smaller & smaller, you might like to consider using bulk bags to receive your landscaping products. Using bulk bags can enable your products to be craned directly to the spot they are needed. This can be invaluable for cottage blocks, small courtyard areas or into backyards with poor access. 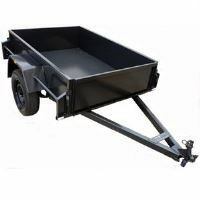 Great for large and small construction sites, also shopping centres with restricted access. 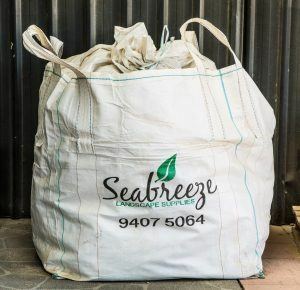 Seabreeze Landscape Supplies will fill our Bulka Bags with any product from our yard, and deliver anywhere. Call us for very competitive bulk bag prices. We provide complementary 6×4 trailers free of charge for 2 hours per load when you purchase one of our products. Please note our trailers sole purpose is for the delivery of purchased products from our yard to your drop off point. They are not to be used for cartage of other items to other locations (a load to the tip).